University Mitsubishi is a Mitsubishi dealership that specializes in selling and servicing all of Mitsubishi’s newest models, but we are more than that, too. University Mitsubishi has always sold used cars and as a dealership located in the “Cowboy Town” of Davie, we’d like to say large trucks made by Ford, Ram and Chevy are our secondary specialty because we always have a lot of used trucks available. Well, now University Mitsubishi has a new service technician and we offer more niche car services! University Mitsubishi now services classic and vintage cars and we add lifts to trucks. 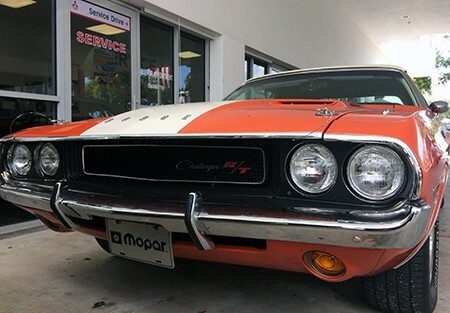 It’s definitely much different working on a classic 426 HEMI engine on the 1970 Dodge Challenger (shown above) rather than a 2.0-liter engine on a 2016 Mitsubishi, and we like the variety. So whether you want your truck to be a few inches higher off the ground, or if you have a classic car model that you need worked on, contact University Mitsubishi’s service department at 954-745-9380 and ask for Peter or Mark!